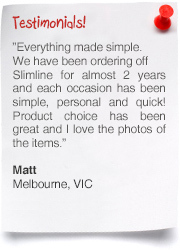 iPad Holders are Ideal for Placement in Retail Stores using Lockable Mount! 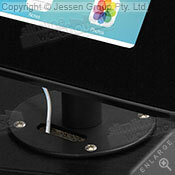 Desktop iPad stand designed to hold Apple® iPad 2, 3, 4, Air, Air 2 & 9.7" Pro in portrait or landscape orientation! 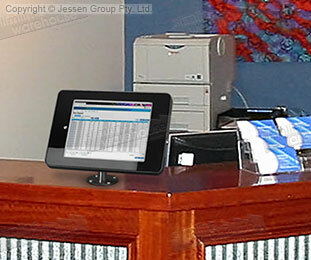 These iPad holders offer an easy way to securely display your tablet at your business for customers and employees to use. These displays are great for placement in retail stores, exhibition halls, restaurants, cafes, bars, schools, libraries, and reception areas. 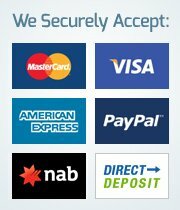 These high-quality units offer many features to help your business. The Apple iPad holders, like a desktop iPad stand, are a lockable display to help secure the unit during display in public areas. By locking your display, you help to prevent theft of your tablet. Keys are included with your purchase so employees and management have access to the interior of the display. The table stands mount to your table or countertop with the included hardware in order to securely affix the unit at your business. The desktop iPad stand is made from steel in order to provide a durable display that will last for years to come in any location. The black finish of the unit adds a stylish look to any décor in order to easily fit in with your environment. This stand is able to rotate 360° to hold your Apple tablet in portrait or landscape orientation with ease. 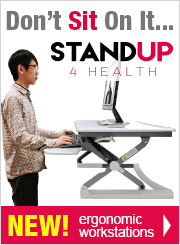 The stand is also able to tilt back and forth in order to better be accessed by both employees and customers. The home button is covered as well allowing patrons to use your designated app. 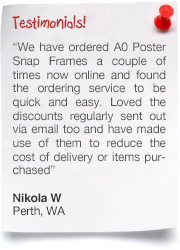 This affordable display makes a great addition to any business marketing strategy. Please Note: This product has been designed to fit Apple iPad® 2, 3, 4, Air, Air 2 & 9.7" Pro. Although other makes & models of tablets may fit into this unit, there is no guarantee of an accurate fit. 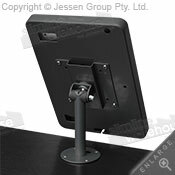 The desktop iPad stand helps you to offer customers a look at your products or website to get a better idea of what you offer! The various tablet mount stands we offer include floor standing and wall mount options in addition to this counter-top version to meet all of your display needs. The huge online catalogue is home to hundreds of products with new ones added almost weekly in order to stay current with the latest trends, styles, & technologies. Check out all of the hardware accessories, tablet stands, whiteboards, photo frames, table throws, exhibition displays, stanchions, easels, lightboxes, POS signs, cigarette bins, lecterns, & event flags we have to offer! 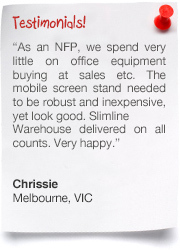 Slimline Warehouse has been a national leader for over 20 years, with a huge selection of products and our low prices helping us to grow a large customer base. 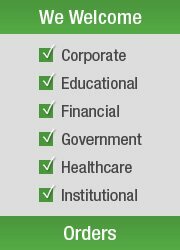 Each item is thoroughly inspected prior to being offered for purchase to ensure our customers only receive long lasting products! 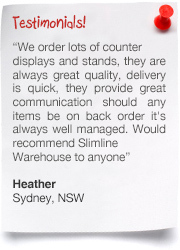 Our warehouse provides same day despatch with most in stock products to anywhere in Australia with products purchased by 1pm EST. 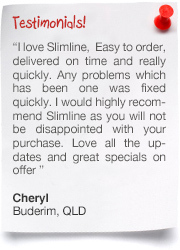 Order today for your location in Bendigo, Townsville, Gold Coast, Melbourne, Sydney, Sunshine Coast, Adelaide, Brisbane, Townsville, Cairns, & Perth!